This document covers version 1. This version has now been discontinued. This page will be left for now. Whether you use babblevoice Desktop for Google Chrome or for Microsoft Window’s, you will have the same screen. This option will display your babblevoice contacts, this contacts can be configured from the babblevoice Control Panel from Devices-> [your device] -> Edit Device -> Phone Book from this list you can then call your contacts. This option displays an input box where you can enter in a number to dial from your phone. If you enter the name of a person plugins can search for phone numbers matching as does babblevoice Desktop search extensions and its own phonebook. 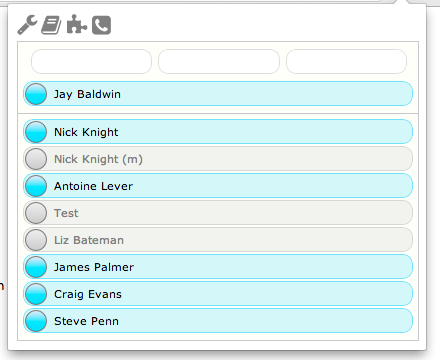 Directly under the toolbar are slots which will display any calls you have on your phone. These calls can be dragged to transfer or hangup and display information such as call timer and caller id. Underneath this is the complete list of devices you have selected that you are interested in. It will show you them logged in or not, on the phone or not, call timer, caller id and so on. If you have manager permissions you will be able to listen in active calls. You can call a colleagues by clicking on their extension. If a colleagues phone is ringing you can click it to pick up that call on your phone.